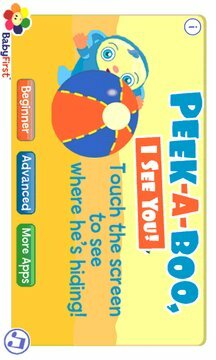 The game of peek-a-boo has entertained babies and toddlers alike for years and years! In “Peekaboo, I See You!” our friendly blue fellow swings, rolls, bounces, summersaults and tiptoes into the hearts of little ones. The interactive game features various objects that Peekaboo hides among. Babies and toddlers must touch an object to see if that’s where he is hiding. The Peekaboo, I See You! game app is based on the hit TV series found on BabyFirst. Now your child can play along in the car, at home or anyplace else with the mobile web game. The game is designed to enhance baby’s observation skills and is sure to result in plenty of giggles and surprises.